An Expert Trading Model that makes recommendations on where to buy, sell, and place stop-losses for all markets and automatically tracks it's own performance. From novice to pro, this mathematically-based system will help you spot profitable trading opportunities. The Day Trader™ expert day trading recommendations based on a system used by commodity floor traders. Personal System Alerts let you build and test your own technical system then alerts you when new trading opportunities arise. Personal Trade Tracking will analyze your trades and keep track of your performance. With Personal Hotline you don't need to be an expert to reap the benefits of technical analysis. Personal Hotline will help focus your attention on potential trading opportunities, increasing your chances of being in the right place at the right time. As your technical analysis skills grow, you will benefit from the most complete charting and technical toolbox available. Personal Hotline's unique blend of expert systems, charting, and analytics has made our customers the envy of traders around the world that don't own a Mac! The product of over fifteen years of development, Personal Hotline is a must for any Mac user that is serious about their money. Personal Hotline outsells our other products 4 to 1 because it is the one product you can buy for your Mac that can positively increase your bottom line. "I love the software, Trendsetter has changed my investing life, not to mention my net worth"
While the Expert Trading Model, Personal Alert Systems,Trade Tracking and technical toolbox can all be used independently, using them together reveals the incomparable value of Personal Hotline. Personal Hotline is incredibly easy to use when compared with ordinary charting programs, because it does much of the work for you. Knowing what to look for doesn't guarantee success, you must know when to look, a critical factor which Personal Hotline can help you determine. Our expert model and multiple rating systems discern which charts need closer examination, saving you a very precious commodity: time. An expert model is a system, based on the knowledge of experts, used to make decisions and solve problems. Computers are not smart, but they are incredibly fast. We can ask them to sift through hundreds of securities, applying thousands of rules and calculations, to produce a condensed list of trading opportunities, and they won't get tired or bored. Personal Hotline has been programmed with the knowledge and insight of the most savvy technical traders, giving you the edge you need to succeed in today's volatile markets. 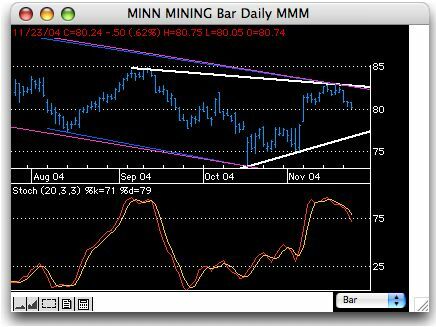 Personal Hotline is far and away the most robust charting and analysis product available for the Mac. Professional traders love the Computer Generated Trendlines that automatically track and chart significant highs and lows. This same intelligence automatically draws Fibonacci, Gann, Trident Linear Regression and Speed Lines. Traditional Bar, Japanese Candle, Line, Point & Figure, Semilog scaling and our new Compare charts are all available in daily, weekly or monthly format and all are created with lightning speed and incredible color and clarity. A monthly bar chart created from 25 years of daily data can be created faster than you can blink your eye! Personal Hotline's technical toolbox is unmatched as well. From Gann to Fibonacci, Welles Wilder to Dr. Elder, its all here. 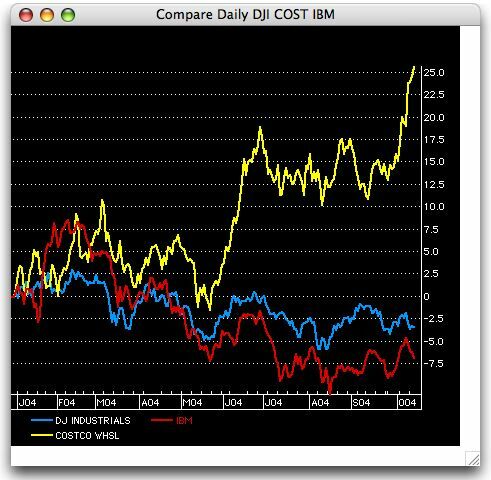 "the most complete technical analysis program we've seen for the Mac." Candle Pattern Analysis... Yes, Personal Hotline will identify significant candle patterns on chart with pop-up explanations providing invaluable instruction to the novice and confirmation to the expert. Technical Screening... imagine your software searching your list for securities with volume greater than average volume, that are within 90% of their 12 month highs and whose RSI value is less than 30. Now imagine that you have this capability with dozens of rankings and virtually unlimited control of the criteria used and the order of preference. Stop imagining, it's all here and it is as easy to set-up and use as font controls in a word processor. 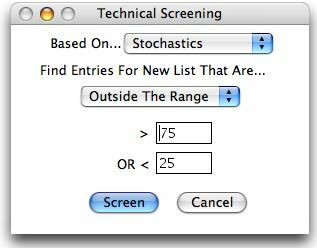 Computer Generated Ratings... apply multiple technical studies to your list of securities en masse, producing numerical ratings that can be used to find trading opportunities. Classic Charting... From Point and Figure to Semilog scaling, Japanese Candlestick to traditional bar, Hotline does it all with the speed, precision and flexibility you need. Innovative Features... like EquiView, Compare and General Market charts found only in our products. EquiView displays two years of prices on the same security on the same chart. Perfect for viewing seasonal tendencies. Compare displays 1 to 4 separate securities on the same chart for comparison. Our General Market charts display an advance-decline line, up volume versus down volume, the TRIN, McClellan Oscillator and McClellan Summation Index. And analytics developed by Trendsetter like our True Range Oscillator, CycleFinder, Trendsetter Momentum Index and Computer Generated Trend Lines give you the edge over other traders and investors. Personal Trade Tracking summarizes your open positions daily and analyzes your trading results historically. Expert Trading Model makes buy, sell and stop-loss recommendations, and tracks its theoretical performance just as it tracks your real or paper trades. DayTrader™ System makes daily recommendations for day trading commodities and stocks. Personal System Alerts enable you to define and test your own early warning system based on 30 technical variables. Candle Pattern Alerts inform you when new candle patterns form. "Personal Hotline gives you data acquisition and management, quote displays, graphics, drawing analytics, indicator analytics, screening and ranking, trading recommendations and portfolio management all in one package - and for less than you'd pay in the DOS world." Based on channel identification and chart pattern recognition, our unique trading model makes recommendations on where to buy, sell and place stop-losses. The model tracks its own trading results, trailing stops and moving objectives as market conditions change. View past trading results on any security before determining how much weight to apply to current recommendations. Our trade tables contain a complete distribution including: winners versus losers; average gain; average loss; net profit after commissions; current and maximum drawdown. You can even view each historic trade independently. Want more? The DayTrader™, makes day trading recommendations on every security you follow, stocks or commodities. The DayTrader is based on a system used by many commodity floor traders. While the DayTrader was designed for the futures' markets, today many stocks trade like commodities. The system projects support and resistance levels based on today's range and where we closed within that range. And, Hotline automatically tracks the past 6 months of performance for all DayTrader recommendations. "Hotline by Trendsetter is designed for investors like me who have made a helluva lot of money thanks to this program. (1) It's understandable and (2) great customer service."